PHOTO BY DAN HOWELL The cast of "Steel Magnolias," currently on stage at Blackfriars Theatre. 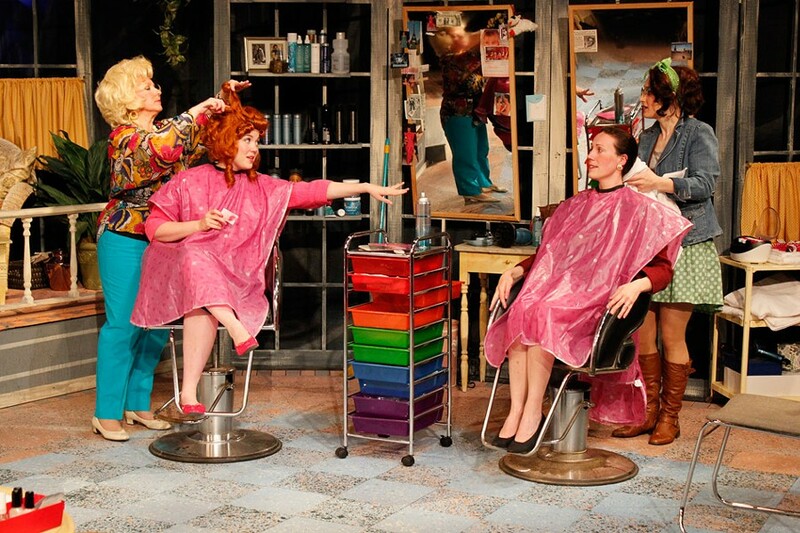 Robert Harling's "Steel Magnolias" has remained consistently popular since making its stage debut in 1987. Bolstered by a successful, star-studded film adaptation a few years later, the play continues to be staged at numerous theaters across the country and just last year was adapted again for a made-for-TV movie featuring an all-African-American cast. The play's enduring relevancy likely stems from a combination of its strong female characters, its themes of the power of sisterhood, and its witty, memorable script. The show includes some powerful emotional moments that can border on melodrama, but Harling's script balances out the pathos with some wickedly funny lines. The challenge with staging a show that has been turned into an iconic film is that, fairly or not, the production is going to be compared to the best-known version of the work. The production currently on stage at Blackfriars Theatre should please fans of the film (and the play itself) and includes some different wrinkles that add new interest to the work. The play is remarkably similar to the 1989 film version. Much of the dialogue from the movie was lifted from the play — including basically all of the choice zingers — as was the entire plot. Six Southern women gather to discuss their various personal lives, with a particular emphasis on the complicated relationship between bride-to-be Shelby and her mother, M'lynn. The main differences between the film and the play are that the action of the play takes place entirely in Truvy's beauty salon, and that none of the male characters ever appear — they are only mentioned in dialogue. The strict focus on the relationships between the women is a strength of the play, and allows some of the secondary characters to shine more brightly. Beautician Truvy's mentor-turned-surrogate-mother role with odd duck Annelle is explored a bit more, as is recent widow Clairee's discovery that life has much more to offer than simply being a small-town mayor's wife. Director John Haldoupis has a talented cast, and one of this production's greatest strengths is the easy, believable chemistry between all of the characters — these women really seem like lifelong friends. While every actor in the cast performs well, there are a few standouts. Mary Tiballi is breezy and natural as Shelby. The character is complex, because while Shelby is plucky and sweet (pink is her signature color), she's also immensely stubborn and, arguably, a bit of a brat. Tiballi doesn't shy away from any of Shelby's negative characteristics, but brings a natural lightness to the role that makes us forget all about them as soon as she flashes that coquettish smile. Cara D'Manuele has the show-stealing role of Ouiser, and she commands the stage as soon as she barges through Truvy's screen door. D'Manuele's Ousier is loud, brash, and liberal with licks from her acid tongue, but also believable in those moments when her carefully hidden humanity gets dragged out of her. D'Manuele also demonstrates excellent comic timing and body language. I found the most interesting portrayal in the show to be Alexa Scott as M'lynn. Scott appears younger than you might expect for a mother-of-the-bride role, and more importantly she's more reserved than the sugary-sweet M'lynn from the film. This take makes more sense as the show goes along, given the complicated-yet-loving relationship she has with her daughter. Scott does an especially good job in the third scene, when M'lynn and Shelby hide an unspoken secret from the ladies in the salon. I worried that the more staid approach to the character might be problematic in the play's final scene, which calls for M'lynn to have an emotional meltdown, but Scott cranks it to 11 in a raw, evocative performance. She's clearly capable of hitting all the emotional notes, but needs to work on connecting the dots. M'lynn is in an unstable state by the end of the play, but there's still a narrative disconnect for a woman to be wailing to the heavens one moment and giggling like a school girl the next. Director Haldoupis's set features a Spanish-moss backdrop that instantly sets the play in the swampy South, and the beauty-parlor interior makes full use of the Blackfriars stage. But the layout created some issues. One of the virtues of the current Blackfriars space is its quasi-in-the-round setup. The actors in the show moved as they would in an actual salon. But depending on where they were standing when delivering their lines, some sections of the audience missed entire exchanges. For example, toward the end of the play Annelle takes a seat at the hair-washing station, with her back to half of the audience; I literally had no idea what she said at that point. Similarly, in the show's emotional climax, several key lines were impossible to hear as the women swarmed around one another, including Clairee's classic "Take a whack at Ouiser!" speech. Lana Momano also deserves praise for her costume and wig designs. Given that the show takes place in a salon, the look is important. Momano's hairstyles range from substantially different looks for each scene for some of the characters (Shelby) to minor but still apparent changes for others (Truvy), all of it done between scene changes.